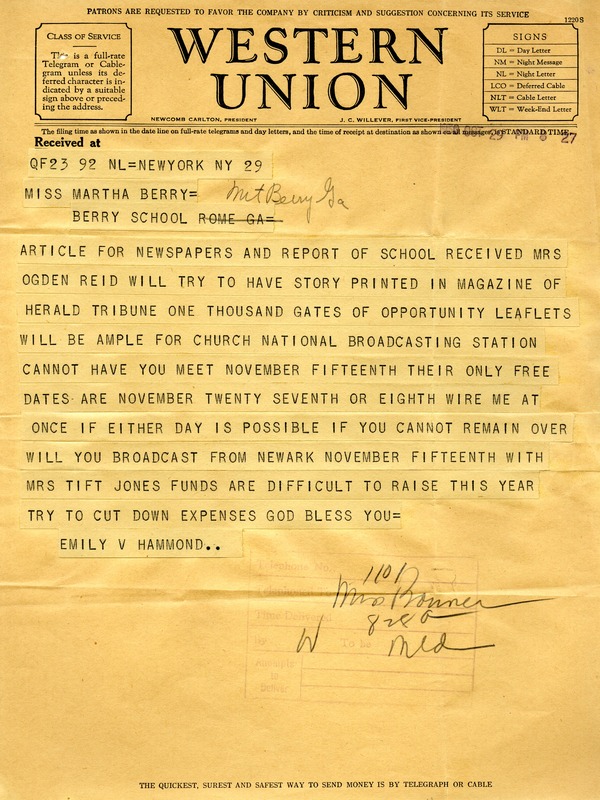 Telegram to Martha Berry from Emily Vanderbilt Hammond informing Martha Berry that the newspaper articles and report of the school have been received and that Mrs. Ogden Reid will try to have a story printed in the Herald Tribune. Hammond asks Berry to confirm a date for her radio broadcast. She cautions that funds are hard to raise and suggests that Berry try to cut expenses. Emily V Hammond, “Telegram to Martha Berry from Emily Vanderbilt Hammond.” Martha Berry Digital Archive. Eds. Schlitz, Stephanie A., Sherre Harrington, Chelsea Risley, Adriana Spencer, Meg Ratliff, Kasey Haessler, Rachel Renaud, et al. Mount Berry: Berry College, 2013. accessed April 18, 2019, https://mbda.berry.edu/items/show/12884.